Privileges aren’t always what you’d think they are. When my siblings and I were in school, my parents took a keen interest in our local school system, in order to be certain we were getting the best education possible. My father was heavily involved with the school’s foundation, a charitable trust organization that raised money to benefit the school. The year I turned 18, he campaigned for a bond issue, wherein the town agreed (by popular ballot) to borrow money to greatly expand the school’s physical plant in response to a growing student body. The school bond campaign did a voter registration drive that reached out to the outgoing seniors, entreating everybody who was 18 or would be by the election to register. The bond measure passed by what to my recollection was an overwhelming majority. Fundraising is not the only way my parents were involved in my education. My mother in particular was a fierce advocate for my disability accommodations, well-armed with the facts about my needs and my rights. Both of my parents had the opportunity and wherewithal to fight for my education, and they did so. One tangential result of this is that I grew up with a basic understanding of what a charitable foundation is and what a bond issue is. That is itself a privilege and a form of education. Becuase of this privilege, my eyebrows didn’t automatically raise when I heard that the Clinton Foundation was taking money from anyone who would give it, including (gasp!) foreign governments, in the (shock!) Middle East and elsewhere. I understand that just because it’s got her name on it (well, her family’s) doesn’t mean it’s her piggy bank, checking account, or campaign war chest. I’m a bit embarrassed to realize how long it took me to catch on that not everybody grasped that distinction. It’s obviously possible to treat a charitable foundation like it’s your personal slush fund (more on that later) and I figured everybody who was pointing alarmed fingers at the Clinton Foundation was just assuming that was happening. Certainly that’s what the talking heads on TV were talking about, at least directly. But over time spent watching or engaging with rank-and-file voters who saw the Clinton Foundation as an example of enormous and obvious corruption, it became clear that a lot of them just didn’t understand that there was even supposed to be a difference between giving to the Clinton Foundation and giving to Clinton herself. They described reported donations by members of foreign governments and royal families as being campaign contributions. They either thought the “Clinton Foundation” was a name for Hillary Clinton’s campaign, or that it was like a company owned by the Clinton family. I was talking about how good the right has been about understanding the importance of framing the narrative and how good the left has been about letting them do it, sometimes by ceding points that really don’t need to be (and shouldn’t be) ceded and sometimes by simply not understanding that things need to be framed. In all of the defenses I heard about the Clinton Foundation, I never saw anyone giving even the five second nutshell explanation of what “foundation” means in this context. Absent that information, the defenses weren’t very compelling. It looked like her defenders were just glossing over glaring and obvious misdeeds like they didn’t matter, which played into the appearance of arrogance. And “But think about all the good things X did!” is only a compelling defense to people who are already on X’s side. 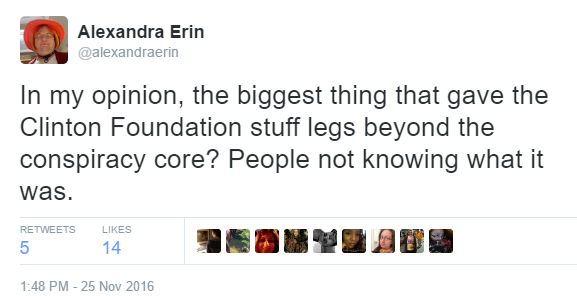 Obviously not everybody who was critical of the foundation had this misapprehension. But their concerns and critiques were magnified and amplified by an acoustic environment more conducive to noise than signal. Some of the critics were making the same naive error as the defenders, that of assuming everybody knew what they were talking about. Some were counting on listeners making associations that they themselves did not explicitly make. “Clinton campaign funded by foreign Muslims” is not a bad idea to have floating around, if you’re campaigning against Clinton, foreigners, and Muslims. Clinton is no longer running for anything. Neither is her opponent, that he can’t seem to stop campaigning. But I thought about this again today, when I saw one of his supporters in a thread about Eric Trump reportedly suspending his charitable fundraising say that people were confusing the issue by bringing up Donald Trump buying stuff for himself “with his personal foundation, his private foundation, not his charitable one”. That was when another penny dropped for me. The flipside of people not understanding the layers of separation between giving money to Hillary Clinton and giving money to the charitable foundation to which her family lends their star power and good name. If you think “The Person Foundation” is just a high-faluting way of saying “money belonging to The Person”, then when people talk about the Trump Foundation breaking rules against self-dealing, it just sounds like people are getting hung up on procedural nitpicks and bureaucracy. You hear Trump paid for a lawsuit settlement out of his foundation, you think it’s some kind of obscure, esoteric legal “Gotcha!” Oh, he took the money from the wrong account. Who cares? It’s his money, isn’t it? Why make it complicated? Can’t a man buy a picture with his own money? It’s his, isn’t it? And so on. A lot of digital ink has been virtually spilled on the need for empathy with Trump voters, and how “intellectual liberal elites” are “out of touch” with “real America”. Well, I’d be hesitant to validate those notions entirely (particularly as they are textbook examples of the right framing things to their satisfaction), but an extremely important stage of communication that was lost on the left in this election is the part where you consider how the thing you’re fixing to say is going to sound to the person who hears it. Simply put: if you don’t know where your audience is coming from, your audience isn’t going to know where you’re coming from. Now, this is not Thinkpiece #5,382,483,290 about The Real Reason Clinton Lost. I do not mean to suggest that if liberal talking heads had prefaced their remarks with, “Well, of course, the Clinton Foundation is a sort of independent corporation set up to manage charitable contributions in the name of the Clintons, so we should be very clear that giving money to the foundation is not the same as giving money to the Clintons themselves,” it would have ended the hoopla and won the election. There were a lot of things going on, and a lot of people were highly motivated to believe the worst. But it couldn’t have hurt, and might have helped. Rather, the message I’m sending is: don’t assume your audience knows the same things you do, that what is obvious and goes without saying to you is the same as what is obvious and goes without saying to everyone else. We didn’t all come up with the same sort of educational foundation.